This week’s TTT topic is Platonic Relationships In Books (friendships, parent/child, siblings, family, etc.). After spending Thanksgiving at my mom’s and spending some quality time with my younger sister, I came home feeling very thankful that I have such a great relationship with her. There’s nothing quite like that bond between siblings. 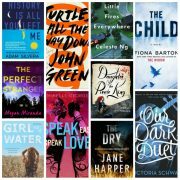 For that reason, I decided to use this week’s topic to share some of my favorite sibling relationships in books that I’ve read. Whether it’s their witty banter, the sibling rivalry, or just good old-fashioned overprotective siblings, these literary siblings really captured my heart when I read their stories. I don’t think any list of siblings would be complete without this crew. Is it possible to even call yourself a Game of Thrones fan if you don’t love the Stark siblings, especially Arya, Sansa, and Jon? As much as I enjoyed all of the romantic possibilities in this story, what I loved most was the close relationship between Lara Jean and her sisters. It’s all about the witty banter between these two! Talk about your sibling bonds – these two are literally tethered to each other by an actual bond. I think this was my first ever favorite siblings. Didn’t everyone want a brother like Jem and/or a sister like Scout? That sibling bond is strong even though they were all adopted and don’t meet each other until they’re teenagers. This relationship really grew on me, especially since they were step siblings and since Theo acted like such a jerk at first. He really grew on me as he warmed up to Jessie though. I’m a big fan of the closeness between Lizzie, the protagonist, and her older sister, especially the idea that Lizzie was the overprotective one. 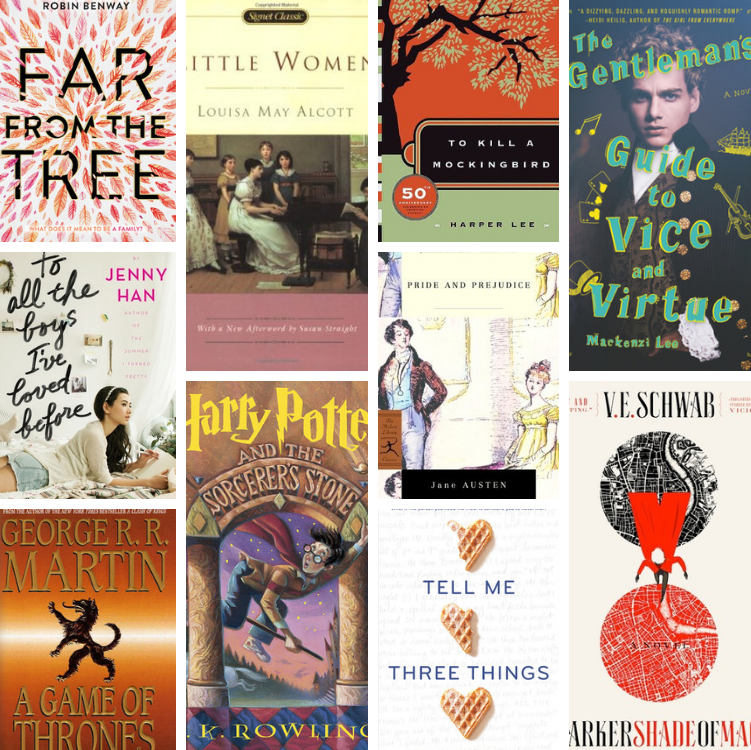 Who are some of your favorite siblings from literature? I included the March sisters on my list. I focused on families, but I love thinking about siblings in books. You made so many great choices. The March sisters are just the best! Wow you really nailed this list!!! So many I totally agree with – especially The March Sisters. And Grace, Maya and Joaquin… oh my goodness, I love those three so much! Right? I want to laugh every time I even think about Monty and Felicity, lol. Aw the Stark siblings are such a great example…Arya and Jon especially. And yes, the Weasleys! The Weasleys are so great! I love the Weasley family so much, so I couldn’t agree more. Monty and Felicity were ones that I considered for my list as well, and I love Kell and Rhys! Wonderful list! The Weasleys and the Bennets are my favorite siblings <3 great choices! I adored that trio in Far From the Tree. It was really special how they embraced each other so quickly and fell into those familial roles. Lara Jean and her family are one of my all-time favorite YA families. So much to love about them. Not that Top Ten Tuesday is a competition but I think you just won it, based solely on this list. Ugh, everyone’s been killin’ it with so many great picks this week! But yes, yours is kind of flawless? Moderns and classics, ahoy! (I don’t know why I just said ahoy?) but seriously, great list–thanks for sharing! Great list! I totally agree about the Weasleys, and I love the Starks, too – I’m really rooting for them! Right? Same here with the Starks. They’ve just been through so much. I need to re-read Little Women at some point too. It has been years since the last time I read it. The Weasleys! Yes! I loved how large their family was, and wish the older brothers had been included in the movies a little more. I’m also a fan of Scout and Jem! I think they had a very realistic relationship, and it was clear the two cared for each other even when they fought. Glad I’m not the only Scout and Jem fan. They were so great. What a wonderful list, Suzanne! I can’t believe I’d forgotten about Harry, Hermoine and Ron for this TTT — they still do it for me! Right? Same here. Love them! YES! I’ve read a lot of these books, and I agree. The Weasleys are my favorite fictional family. I thought about putting the Stark kids on my list, but I ran out of space. I love too many fictional families. I love too many fictional families as well. I probably could have easily done a top 20 or 30, lol. So agree with no sibling list being complete without the Weasleys – just love that family! I also really enjoyed the sibling bond in Far from the Tree, as you mentioned; so wonderfully well written. Great list! Awww! I love this week’s topic! I should really get back into doing more blog memes like this again. WE’ll have to see what my life schedule allows next year. I adore the Weasleys as well, although I never loved Percy! 🙈 And the Starks! Oh gosh. I’m so excited for the TV series next year. Terrified too though. Monty and Felicity are great aren’t they? And yes – you’re right about Lizzie and Jane! I also love Mr Darcy and Georgiana together even though they weren’t really given much ‘on page’ time. You could just see how proud and how protective he was of her. Haha, I never liked Percy either. He’s definitely the exception to my Weasley love. The Song Sisters deserve so much more love. And yes obviously Kell and Rhy are amazing. Right? I really miss reading about Kell and Rhys.